This enamel by Jean-François Favre was probably painted in Paris or Geneva. It depicts French politician Jean-Joseph Mounier, who was involved in the struggle between Parliament and Court on the eve of the French Revolution and was secretary of the assembly that drafted the grievances presented to Louis XVI. Elected president of the Constituent Assembly in 1789, he disapproved of later proceedings and resigned his post the following year. 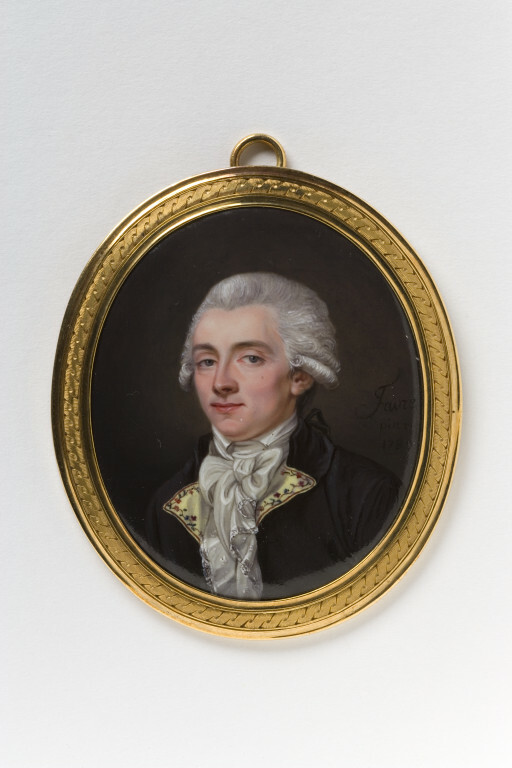 The practice of painting portrait miniatures in enamels developed out of the decorative work of goldsmiths and watchmakers in the French cities of Blois, Châteaudun and Paris. Portrait plaques had been made in the enamelling workshops of Limoges in central France during the 16th century, but in the 1630s, Jean Toutin adapted existing techniques to make the subtle colouring and delicate detail of enamel miniatures possible. Small objects like watches or snuffboxes were ideally suited to this technique and many were decorated with portraits and mythological or allegorical scenes. Artists throughout Europe continually refined their approaches to painting enamel portraits. While 17th century enamellers used a very fine stipple to create light and shade in their miniatures, artists in the 18th century began to use larger brushstrokes for a more fluid effect. Oval portrait miniature of Jean-Joseph Mounier shown bust-length, facing left, wearing a powdered wig, a dark grey coat, a yellow embroidered waistcoat and a knotted cravat. The frame is of gilt-metal with a ribbon twist border. Provenance: Mr Ben-Simon, Paris, 1923. D.S. Lavender, London, 01/10/1982. 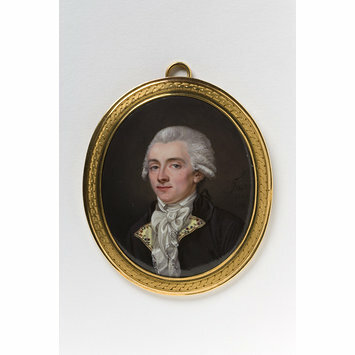 Enamel miniature on copper of Jean-Joseph Mounier, in a gilt metal frame, Paris or Geneva, 1789, by Jean Francois Favre. Clouzot, Henri. 'Les maîtres de la miniature sur émail au musée Galliéra', Gazette des Beaux-Arts, VIII, 5e période, July-August 1923, p. 58. Clouzot, Henri. Dictionnaire des miniaturistes sur émail, Paris, 1924, p. 230. Clouzot, Henri. La miniature sur émail en France, Paris, n.d.. [c. 1925] p. 140. Hofstetter, Bodo, 'La Miniature sur émail suisse à la fin du XVIIIe siècle'. In Genoud, Jean-Claude (ed. ), 100 ans de miniatures suisses 1780-1880. Musée historique de Lausanne; Geneva: Slatkine, 1999, p. 66, p. 67, fig. 83. Coffin, Sarah and Bodo Hofstetter. Portrait Miniatures in Enamel. London: Philip Wilson Publishers Ltd. in association with the Gilbert Collection, 2000. 168 p., ill. Cat. no. 21, pp. 69-70. ISBN 0856675334.